The AeroPilates Pro 565 Reformer is the luxury, non-foldable AeroPilates reformer you need to get the most out of your practice. Its oak trim and classy design will look great in any home. This reformer is also ideal for taller individuals because of the 2″ of extra platform travel (67″ total). And with four heavy-duty springs, adjustable pulley width, and adjustable foot bar, you’ll be able to further customize your routine. 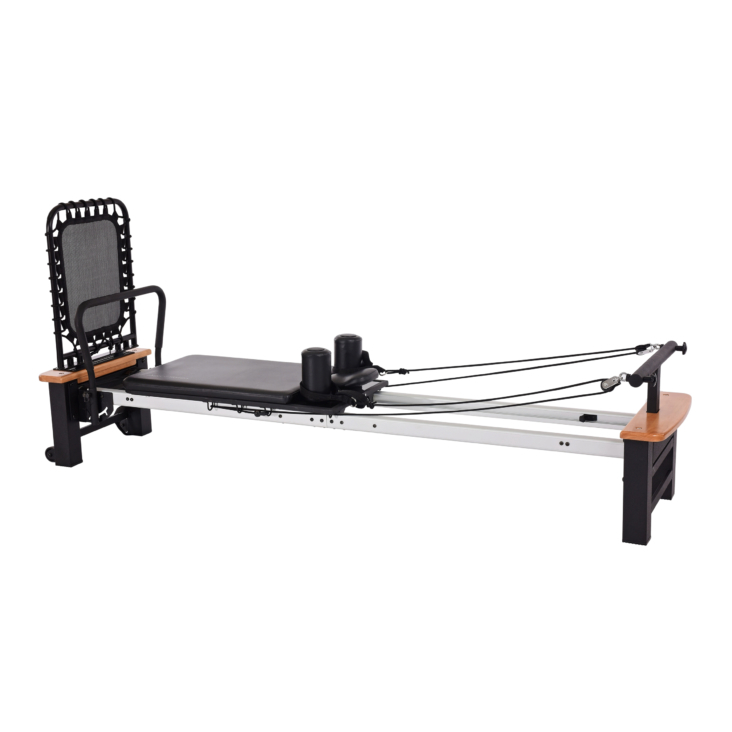 The Pro 565 Reformer’s attached, elevated stand makes getting on and off easier. Some exercises are not possible without a raised reformer. This makes raised AeroPilates reformers an excellent option for advanced practitioners or those who want to get the most out of Pilates reformer. Our Patented Cardio Rebounder makes cardio and leg work both fun and challenging. With this larger 15-inch by 19-inch rebounder, you’ll have more versatility than with smaller rebounders. You’ll also be able to perform more exercises with the tilting, removable foot bar. Both you and the machine will be stable throughout your routine. The sturdy, steel frame, four non-skid supports and the weight of the machine will keep the machine in place. Plus, the adjustable head rest and foam shoulder pads will keep your body correctly aligned and in place. To top it all off, the Pro 565 Reformer package also includes the full-color wall chart and the Primer Plus DVD, which features a new two workouts and basic information about your reformer.